Second National Bank recently donated to the Darke County Foundation in support of its scholarship and community grant programs. Pictured (l-r) are Christy Prakel, executive director of the Darke County Foundation; Todd Durham, vice president and trust officer at Second National Bank; and Antonia Baker, assistant trust officer and financial adviser at Second National Bank. 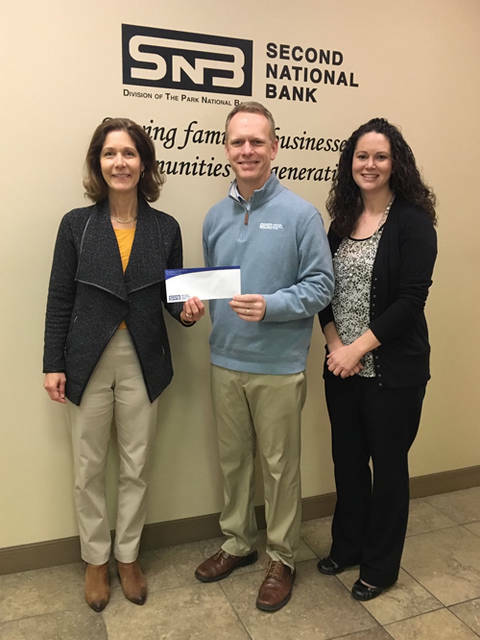 DARKE COUNTY – Second National Bank recently made a donation to the Darke County Foundation in support of its efforts to enrich the well-being of Darke County residents. The bank’s contribution will help provide scholarships to approximately 125 local students and grants to more than 50 local organizations that offer programs and services to Darke County residents. The Darke County Foundation is a community foundation dedicated to improving the lives of Darke County residents by receiving, managing and distributing charitable gifts. For more information, visit www.darkecountyfoundation.org or call 937-548-4673.